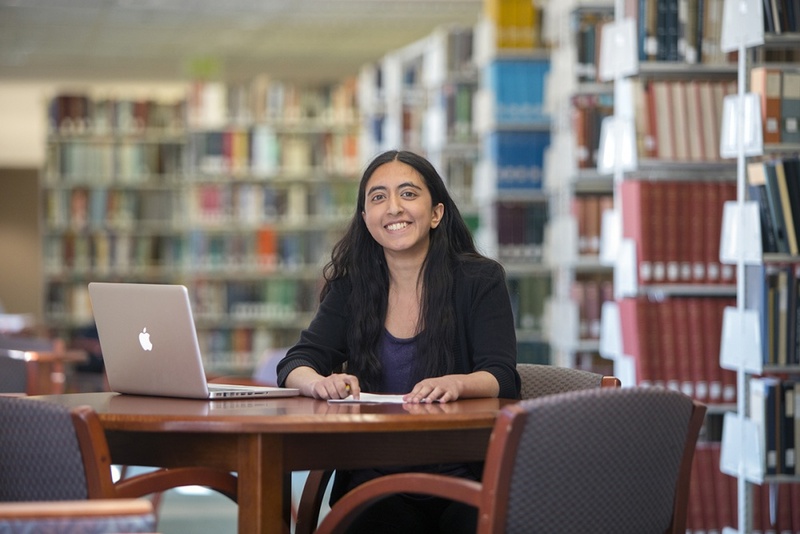 Going up against nearly 200 of the smartest, most highly motivated students from top-tier schools across the country, Sravya Tadepalli wasn't stressed out at all during her interview for the Harry S. Truman Scholarship. That's because the UO junior went into the experience figuring she stood little chance of winning. The feeling was reinforced when she met some of the other finalists at the interview site in Seattle, including one from Harvard and another from Claremont McKenna College. So she approached it as if she had nothing to lose. Perhaps that's why, by all accounts, she nailed it, and became the UO's third winner of this highly prestigious scholarship in the past 26 years. Winning it is what has caused more angst for Tadepalli. "That's the part that's stressful for me," said Tadepalli, who is majoring in political science and journalism. "I have this gift, and I feel this obligation to use it very wisely." Tadepalli was one of 59 scholars chosen from 194 finalists that were whittled down from 756 applicants. The scholarship comes with $30,000 to be applied toward graduate studies in preparation for careers in government or other areas of public service. And now her name is on a list that includes former winners such as members of Congress, U.S. attorneys and high-ranking presidential staffers. The Truman is regarded as one of the most elite scholarships, in the same class as a Rhodes scholarship in terms of its competitiveness. "To have that affirmation from other people that I can get a graduate degree and actually make a difference on a larger scale, to be a leader in public service, is pretty cool," she said. Before going to graduate school, she hopes to work for a couple of years at a think tank to refine exactly what path she wants to pursue. She has an eye toward a career in foreign policy, either in political development or national security. She found out she had won when UO President Michael Schill and Provost and Vice President Jayanth Banavar unexpectedly dropped into her feature-writing class in Allen Hall and made the announcement. Josh Snodgrass, director of the UO's Office of Distinguished Scholarships, was there to lend a hand to Tadepalli through the application and preparation process. She impressed him every step of the way. "It wasn't at all of a surprise that she went in and killed the final interview," he said. "She's one of the best interviewers I've ever worked with. She's just so poised and well-spoken, and with so much knowledge." One question from the Truman interview committee stood out for Tadepalli. They wanted to know how her work as a volunteer with the Hindu American Foundation, in which she speaks to classes addressing stereotypes and misconceptions about the faith, ties into her wanting to work in public service. She discussed the Hindu concept of karma yoga, which is doing good work for other people without thinking of oneself. "You can't do it with personal ambition, personal wealth or power in mind," she said. "You just have to do it for the good of other people. Truman said to never go into politics because you want riches. You have to only do it for the good of others. He embodies this 'service for service's sake.'" Tadepalli almost didn't apply for the scholarship. It took four emails from Elizabeth Raisanen, an instructor of literature and the director of undergraduate advising at Clark Honors College, to get her interested. "As Sravya's advisor, it was clear to me that she had the perfect profile for this award," Raisanen said was the reason behind her persistence. "She has all of the qualities that are valued by the Truman scholarship – a stellar academic record, a deep commitment to leadership and service, and the drive to effect positive change in the world." Tadepalli belongs to the UNESCO Crossings Institute for Conflict-Sensitive Reporting and Intercultural Dialogue. She's president of the Foreign Policy Forum, helps with the Oregon Undergraduate Research Journal and belongs to the Students of the Indian Subcontinent Group. She wrote a play, "The Fruit Stand," which won the University Theatre's New Voices! playwriting contest and was performed last year in the Hope Theatre. She also works at the campus radio station KWVA. She'll travel to Jordan next fall for advanced research on barriers to and opportunities for Jordanian social and political reform. Dan Tichenor, a political science professor who is supervising Tadepalli's honors thesis and runs the undergraduate Wayne Morse Scholars program that she participates in, wrote one of the letters in support of Tadepalli's application. He said the scholarship's timing is perfect as she goes to study abroad, where she can explore these interests with the thought of internships and trainings in mind. "The Truman scholarship will give Sravya nice financial support for her graduate studies," he said. "But it also will provide her with lots of opportunities for hands-on service experiences, networking and professional development." All of this goes back to the idea of selfless giving. And for Tadepalli, the idea of public service dovetails with that perfectly. "I often think about what I want my life to mean for other people, and what I want to leave behind for other people," she said. "That's why I want to be in public service. I feel like it gives you so much opportunity to do an incredible amount of good for other people." Although the Truman scholarship had a large number of UO students seeking to apply, other scholarships haven't generated the same degree of interest. The Churchill Scholarship for graduate study at Cambridge University, for instance, may go years in which no UO students apply. Josh Snodgrass, director of the Office of Distinguished Scholarships, is working hard to change that. He wants students, faculty and staff to know that it is worth it for students to apply. He offers the Truman scholarship – with two winners and another finalist from the UO in the past five years – as proof. "If you look at the numbers, when our students apply, we're pretty good about them winning many of these scholarships," Snodgrass said. "I want to get the word out that these options exist, and that our students are competitive." There are usually four periods each year when applications are due. Now is a critical time for United Kingdom-based scholarships for graduate study. The deadlines are typically in early fall, leaving UO students little time to finish applications since they return to campus at that time. The Office of Distinguished Scholarships is the first stop to learn about the major scholarships. It tracks all of them and their deadlines and assists students with their applications. Even if a student doesn't win a particular scholarship, the experience will have helped refine career plans and future scholarship applications. To find out more about the range of available scholarships or to set up an advising appointment, contact the Office of Distinguished Scholarships at dsinfo@uoregon.edu.